The TMC-1 is available for five different systems, the Avid XMon, DAD AX32 now, Trinnov DMon, the CB A-Mon and the CB I-Mon. 2) Provide a unified user interface for all systems, large and small. The NTP Penta 720 or DAD AX32 ise one of the most flexible digital audio interfaces available, with the TMC-1 interface and software you can control any system from 1 to 64 speakers. The TMC-1 is not a remote to the NTP Dadman software but provides a framework for you to define your own monitoring solution. ADR-style control of Talkback, Listen-back, Studio L/S and Control Room L/S from play and record GP Inputs or LTC and MTC inputs. Stem style monitoring with up to 6 stems each of which can be up to 12 channels wide. Current User guide. 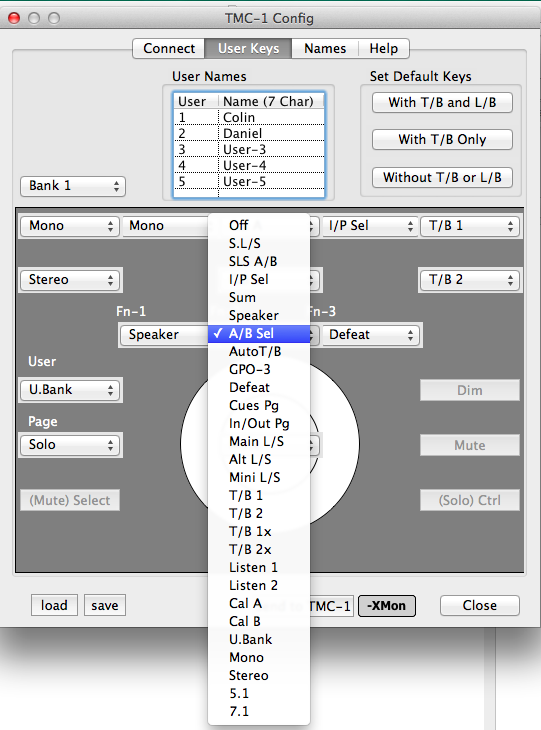 Use with the TMC-1 Reference listed below with description of TMC-1 Penta2 Monitor configuration tool and a case study of a 16 speaker 7.1.4 system using a Dolby RMU (Pinewood studio 6).